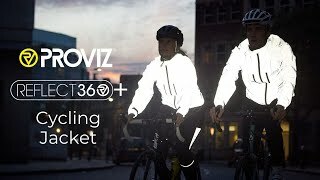 The Proviz Women's Reflect 360 Plus Jacket is the more 'technical' version of the highly successful original REFLECT360 jacket launched in 2014. This version has been designed using a highly technical film to ensure higher rates of breathability while not losing any of the incredible reflective capability of their unique, upgraded reflective material that made the original version a worldwide success and sold in over 70 countries. The REFLECT360+ cycling jacket incorporates a much more tailored fit and uses a unique lighter weight material to help ensure cyclists, who like to push things a little bit harder, to stay cool. The 'through-flow' extra ventilation is still achieved using the same effective shoulder/back vents that allow air to escape without letting in any rain water. Simply open up the front zip vents to achieve maximum ventilation. During winter, these can be kept closed and double up as watertight pockets. The jacket also incorporates an inside chest pocket and large lower back pocket to store any extra layers or a map. A newly incorporated raglan sleeve design also helps to give a superior range of motion and room around the shoulders and upper back. About the fabric: The fabric used for the REFLECT360+ range is designed by Proviz and is highly technical. A brand new film fabric is used to achieve the increased breathability and waterproofing required which is then sealed to our special reflective material. During daylight it is a modest grey colour. At night, when the fabric picks up an external light source, e.g. vehicle headlights, it gives 'astonishing reflectivity' (quote: Cycling Active Magazine). The material is CE EN 20471 certified.